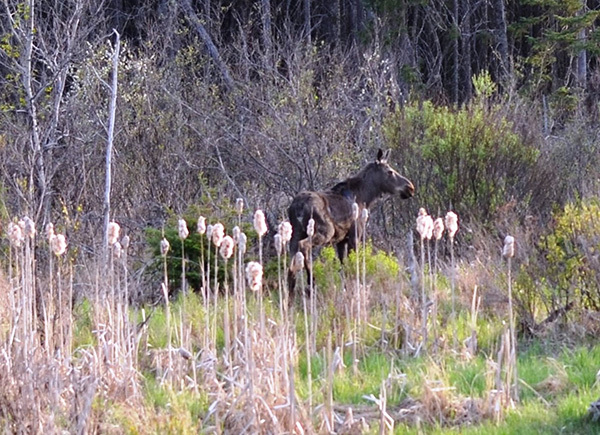 A moose stands not far off U.S. 41 near Humboldt in Marquette County. DNR officials are reminding the public to remember safety and use caution when stopping along roadways to watch and photograph wildlife. Photo from Michigan Department of Natural Resources. Michigan Department of Natural Resources officials are reminding the public to remember safety and use caution when stopping along roadsides to look at moose and other wildlife. Pull your vehicle completely out of the traffic lanes to park. Make sure vehicle has stopped moving before exiting. Watch behind for oncoming vehicles before opening vehicle doors. Do not walk through traffic to cross the highway. Wait until there is a sufficient opening in traffic to cross the road. Avoid having to wait in the middle of the road for cars to pass. Remain aware of where you and others are standing while watching or photographing wildlife. Keep away from traffic lanes. Do not rely on motorists to see you and avoid you. Respect moose and other wildlife as the wild creatures they are. Watch or photograph wildlife from a safe distance. Do not approach or harass wildlife. Keep a sharp eye out for traffic when returning to your vehicle. Use safe crossing methods. Watch for approaching vehicles when pulling your vehicle back onto the roadway. Merge properly with traffic. For more information on wildlife and wildlife viewing visit www.michigan/gov/wildlife.